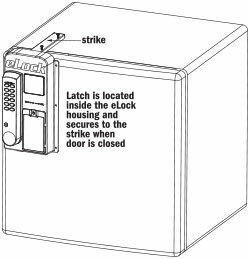 CompX eLock 100 Series is a keyless, non-network, electronic access control lock for cabinetry, refrigerators, freezers and incubators. 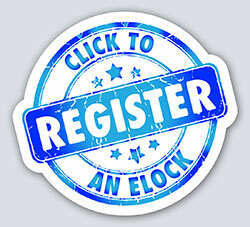 eLock provides an audit trail of the last 1500 access attempts, including date, time and user name. 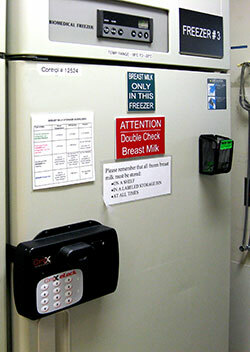 CompX eLock 100 Series, available in cabinet and refrigerator versions, allows for audit trail reporting (last 1500 access attempts) and up to 250 unique ID codes to be entered. It is a keyless system – there are NO keys to lose or share. The eLocks can be programmed to read a facility's existing employee identification cards using HID proximity, HID iCLASS proximity, or magnetic card credentials. 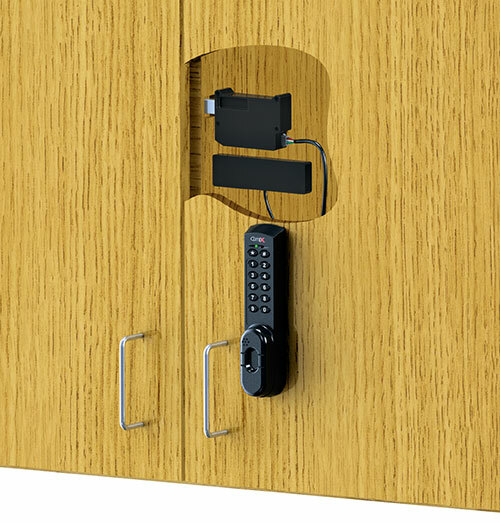 Cabinet version has three components — eLock unit, battery pack and latch — eLock unit mounts directly on the outside of the cabinet door or drawer, while the battery pack and latch are mounted inside. Refrigerator / freezer versions have all three components enclosed in a housing, which mounts directly to the appliance door. The strike plate is easily mounted on the top or side of the appliance and provides a secure latching point for the latch. Both cabinet and refrigerator versions use the same motor-driven latch mechanism that provides automatic relocking. CompX eLock 100 Series is a keyless, non-network electronic access control for cabinetry. Since the eLock is keyless system, there are NO keys to lose or share. The eLock also provides a comprehensive audit trail of the last 1500 access attempts – including date, time and user name – which can be downloaded and viewed with LockView 3 software. The eLock can hold up to 250 unique user codes and can be programmed to read a facility's existing employee identification cards using HID proximity or magnetic card credentials. The cabinet version has three components: eLock unit, battery pack and latch. The eLock unit mounts directly on the outside of the cabinet door or drawer, while the battery pack (6-AA) and latch are mounted inside. Since the batteries are located inside the cabinet, every eLock unit includes a jump start 9-volt power port, which allows the user – with a valid credential – to access the eLock when the batteries are exhausted. All eLocks have non-volatile memory, ensuring that all users, audit trails and other programmed features are not lost in the event of a power outage. To download audit trails, set up time-based restrictions or other programmed features, LockView 3 software installed on a Windows based laptop is required. The LockView 3 software kit includes software flash drive, RJ-11 cable and USB dongle. Connect one end of RJ-11 cable to port on the back side of the eLock and the other end to the port on the USB dongle. 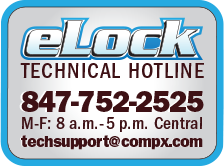 CompX eLock 100 Series is a keyless, non-network electronic access control lock for refrigerators / freezers. Since the eLock is keyless system there are NO keys to lose or share. The eLock also provides a comprehensive audit trail of the last 1500 access attempts - including date, time and user name – which can be downloaded and viewed with LockView 3 software. The eLock can hold up to 250 unique user codes and can be programmed to read facility's existing employee identification cards using HID proximity or magnetic card credentials. Refrigerator / freezer versions have all three components – eLock unit, battery pack, and latch - enclosed in a housing which mounts directly to the appliance door. The strike plate is easily mounted on the top or side of the appliance and provides a secure latching point for the latch. All eLocks have non-volatile memory ensuring that all users, audit trails and other programmed features are not lost due to loss of power. The motorized spring loaded latch provides the convenience of automatic relocking – eliminating the need for cumbersome hasps and padlocks. To download audit trails, set up time based restrictions or other programmed features; LockView 3 software installed on a Windows based laptop is required. The LockView 3 software kit includes software flash drive, RJ-11 cable and USB dongle. Connect one end of RJ-11 cable to port on the back side of the eLock and the other to the port on the USB dongle.